Stela no.14, the best preserved of the stelae from Uxmal's stelae platform, moved to Site Museum in 1983. The images on both stelae nos.14 and 2, on display in the Site Museum, concentrate on a single figure, following the classic stela motif. 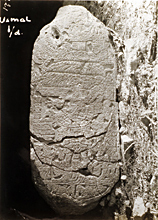 The same Stela no.14, here photographed by artificial light at night, when lying on its side on the stela platform (photo rotated). Photograph by Dan Leyrer as member of Blom/Tulane expedition, 1930. Scanned from 35mm slide of the original photograph (M.31.4.594). Reproduced with permission of the Middle American Research Institute (MARI), Tulane University. Posted diagram of Stela no.14; drawing is generalized, not exact. Lord Chak, with broad-brimmed feathered headdress and other royal regalia, standing in a formal heel-to-heel pose on a two-headed jaguar throne. Lord Chak, standing on a two-headed jaquar throne; a warrior holding a circular shield at the right, two smaller figures at left, two captives below.